I made this place out of spite and frustration. I'm a big fan of mandalorians, especially the "modern" ones that present ordinary people becoming fearsome and absolutely cool when they wear their homemade combat armor and outfits to do cool stuff around the galaxy. Sadly, a lot of sites and community tend to revolve around clones or costuming. I just wanted a place where I could post stories and artwork about Mandalorians in general, and encourage others to dare trying that path as well. My deviantArt page and my Fan fiction collection. If you don't read them I won't feel offended, but you should be ashamed of yourself for not being curious. You may copy and paste these questions. Pharmacy student. Want to see some organic reactions? Learn about the generation time of Escheria coli? I'm obsessed with Mandalorians, probably like most of you. I love writing about them, too, and talking about them with friends! None of the people I know around here like all this stuff, so I was glad to hear Daennika was going to start a forum where we can meet like-minded people! I also like the Clone Wars and clones a lot. A lot, a lot. Okay, done. My awful, thrown together in four days trashcan armor: It doesn't fit my chest at all. My Republic Commando fanfic! It's got Jedi conundrums, clone shenanigans, forbidden (and illegal) love, ultra-dramas, Mandalorians, and more plot bunnies than I could fit into one fic. Coming soon: A Mando-centric fic! You're seeing things... You should get that checked, young miss. IF YOU BUILD A SITE, FANDALORIANS WILL COME. And I will meet them. Tadaaa! Alex, but on most forums I use the handle Kex Beziar. I've had it for while and I'm sticking with it. Reading, drawing, attempting to build things, and video games (especially Zelda and Resident Evil). I've been a fan of Boba Fett since I first saw Empire Strikes back and realized that he didn't die after shooting at Luke. I moved on to Jango and the clones as I got older, and now I'm a Fandaolrian. The Mandalorian culture is amazing to me, and I think what really attracted me to them was their sense of family. My homemade Mando armor, my Mando art, and my Mando fics. When I get around to doing them. Hi Kex! Wow, first unknown person to register here. Thanks for joining! ...so if you don't actually have any art, costume or stories to show yet, there's nothing? But yeah, nothing just yet. At least, nothing to show you. I have some stuff that isn't on the Internet yet. I got a few names. Some people know me as Vhe (my costuming character), some as Em, and some as Memory. I'd say Memory'd work here. <.< >.> Because I love Mandos? I also enjoy other people who are Mando enthusiasts, and love to share and get feedback on my OC fanfics. drawing, singing, playing bass, tinkering with props for my dream movie...sleeping.. Always have loved mandos since I first knew what they were. Then came my clone trooper fanaticism, which ties into my mandofetishism. Not to mention Daennika's wicked mad uber awesome-tastic, so I have to follow. Patrick, but I use Valthonin for all my online stuff. I just made it up, trying to make a Mandalorian version of it. Something like Val'thonin, but that ending doesnt sound too Mando like. I was recommended by the mod Revan. I also of course love Boba Fett and the Mandalorians and think that theyre the best thing that came out of the Star Wars universe. A familiar name! Thanks for joining. And welcome to mandomemory, Shas Kal'Abra and Valthonin! All remarkable people for registering to this site. ...not sure if I'll keep the warm welcoming ritual on when we get over a few hundred new members, so enjoy it while it lasts! Ha! Well, I figure I have to assert myself early on, so when this forum IS huge, I'll be a senior member. It's actually kind of surprising that there hasn't really been much of a non-costuming 'MANDO'board before this one... I suppose you've got the Boba Fett fan club, but that's mostly Boba... *shrugs* Interesting. Yeah, you got me. I'm not big on costuming, no longer a huge Boba Fett fan since the whole clone thing and I see great potential in the Mandalorian phenomena.... But most fans seem to stop at the costuming and switch their brains off from there. I TOLD you people would join, Daennika! HI EVERYONE! Everyone seems really cool so far. It'll be fun getting to know you all! Shas, you work in food service?! I'm so sorry. Maybe we can help you keep your sanity (or lose it quicker). Vhe (I'm calling you Vhe, I've decided! ), you give excellent feedback and I really owe you a good read through for your story. I don't know when that will happen, but I will try as hard as I can to start soon! Also, MIDWESTERNERS UNITE! Val, that's so awesome that you're an archaeology student and you have an Indiana Jones costume. I'm so down with that. Strong work! Curious to see where this goes. A board solely for Fando'ade is quite a nice idea, bout time someone put one up. I'll be looking forward to seeing more art, stories and cool OCs I haven't encountered before. Yay Corran Fett is here! Thanks for joining!... when was the last time we chatted besides in dA? I think I remember a few games of Call of Duty 4. Yeah I still play COD4 online when I got spare time. With work, art, writing and my dog there isn't much room left. I quit playing MMO's too. Great catching up! ICQ is so 90's! I remember getting random IM's from old perverts on that thing. This will remain a mystery but for those who know me in a more "intimate" setting. Suffice it to say that I go by commander-13 on most forums or simply "D"
I am a lemming and followed the other 11 over here from Daennika's DA gallery. People are talking about mandalorians, so here I am. For starters, I'm ShinAzure over at deviantart. My updates may be sporatic, but they usually involve mandalorians. 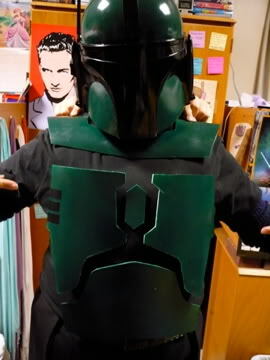 However, my number one thing is that I am a costumed member of the Mandalorian Mercs Costuming Club. Tal Greyheed, not only that name sounds awesome but that picture of your suit screams respect. Thanks so much for joining us! Hot. XD Good to have you here, Commander!